A review in 10 words (or thereabouts): Laurel travels to the moon while her life on Earth falls apart. Laurel Daneau has moved on to a new life, in a new town, but inside she’s still reeling from the loss of her beloved mother and grandmother after Hurricane Katrina washed away their home. Laurel’s new life is going well, with a new best friend, a place on the cheerleading squad and T-Boom, co-captain of the basketball team, for a boyfriend. Yet Laurel is haunted by voices and memories from her past. When T-Boom introduces Laurel to meth, she immediately falls under its spell, loving the way it erases, even if only briefly, her past. But as she becomes alienated from her friends and family, she becomes a shell of her former self, and longs to be whole again. With help from an artist named Moses and her friend Kaylee, she’s able to begin to rewrite her story and start to move on from her addiction. Have you ever read a book and immediately thought, "okay...that's done?" Beneath a Meth Moon neither impressed me or disappointed me. I didn't like it, and yet I didn't dislike it. Laurel's past is filled with heartache...and with meth, the heartache disappears. She yearns for the numbness. She's convinced she's not addicted. She's convinced she can stop whenever she wants. But the moon is too enticing, and before she knows it, she's run away from home, living on the streets, waiting for her next fix. 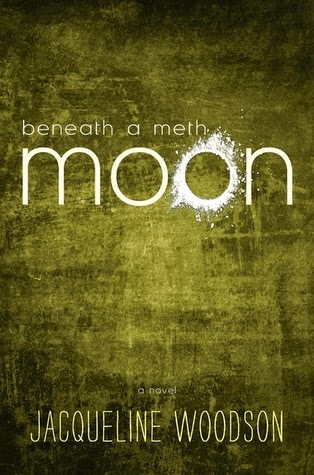 Beneath a Meth Moon is a sad story, as all stories about teenage drug use tend to be. Laurel had a strong family structure and a positive support from her best friend Kaylee, but one poor choice with one handsome teenage boy, and Laurel's life rockets out of control. There's not a lot in the way of character development. I never really felt like I got to know Laurel, and there never really seemed to be a pain so overwhelming that she wanted to escape. She missed her mother and grandmother and thought of them often, but she was living her life, getting involved with school and learning to move on. Perhaps that's the point. Addiction is a disease without rhyme or reason. Laurel's story is definitely one that could benefit teens playing around with drug use. It can destroy your life, and it can do it quickly. Luckily Laurel had a guardian angel watching over her and a family that refused to let go. A Gnome...A Girl...and 60 Authors. Holla!